Mireya Navarro, an environmental writer for the? ?New York Times,?has just written a wedding book for today’s eco-friendly world called?Green Wedding: Planning Your Eco-Friendly Celebration . The book features stories from couples who have “greened up” their dream weddings, along with beautiful photos and ideas for an eco-friendly wedding celebration. If your guests are interested in global-warming, and they should be, they will appreciate the efforts made by the?environmentally responsible bride and groom. Green principles will give you a much needed reality check as you grapple with the emotions and stresses of wedding planning. If you risk drowning in the wedding 100-item to-do checklist, a green wedding throws you a no-waste life ring. ?It gives you an armor to fend off unwanted pressures from relatives, friends, or vendors trying to covince you to spend lavishly on fancy tablecloths or flower arrangements. It adds clarity, sorts out priorities and choices. “That’s not? ?green!” you can resond to a pushy helper and move on. 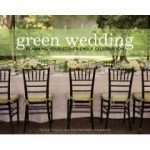 In addition,?Green Wedding: Planning Your Eco-Friendly Celebration ?will make a great gift for a couple who just got engaged.